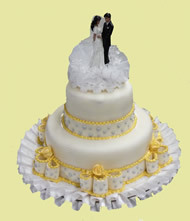 We specialize in helping you create your custom wedding cake or you can order from any of our photo albums on-line. Some of the decisions you will be making is what type of cake, how many people do you need to serve, what size you are looking for, and what accessories you desire. Take some time to read about our different cakes, fillings and frosting to help you make your decision. Cake tasting is by appointment only and is free unless you request fresh fruits or fondant to taste. 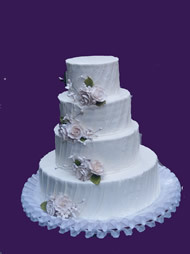 Our wedding cake prices start at $60.00 for a single tier, and are priced according to size and labor involved. Decorations and flowers for the wedding cake can be sugar, gum paste, artificial or we can work with your favorite florist so the fresh flowers match your bouquet. We offer delivery and set up to the whole island of Oahu and the fee is based on mileage and size of cake. Request a Tasting Session – Come in and try it for yourself! As a reminder all of our cakes are NOT Smash Cakes. They do come with support beams. Red Velvet** – A light German Chocolate chiffon cake with red coloring. Add our cream cheese filling and frosting and you have an authentic Red Velvet Cake. Banana Cake – A moist homemade banana spice cake made with fresh bananas. Our Chantilly or buttercream filling is a great addition to this cake. Guava – Chiffon cake infused with guava juice. Some of our most popular combinations are guava filling, lilikoi filling, whip cream, or buttercream. 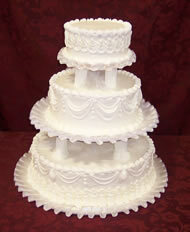 We specialize in buttercream iced Wedding Cakes and Special Event Cakes. Our goal is to work with you to create a design that expresses your taste, personality, style, and theme. We strive to ensure that every detail is just as you have envisioned it. We service the majority of the island’s hotels and resorts, and offer wholesale pricing to our current and potential customers. We work closely with the bride and groom as well as wedding planners. We bake 24 hours a day, 7 days a week, and 365 days a year. Once you have selected your reception site, we recommend that you contact us for your consultation. We only book one year in advance. Please note that we are mainly a wholesale bakery and not a walk-in bakery. Consultations and tastings are by appointment only and reserved for weddings or events that require fondant or have more than 50 guests. For events less than 50 guests, we can correspond by email or phone. There is a nominal fee for our cake tastings/design consultations. This fee is to be paid in advance of the appointment. Your cake tasting will include a variety of flavors and fillings that you will choose when you fill out the Cake Tasting Request Form, since everything is prepared in advance or you can call the office to schedule an appointment. Please bring any color swatches, invitations, dress design, floral inspiration, or pictures that might help in the design of your cake. If you decide to contract with The Patisserie, your tasting fee will be credited to your order. Special event cakes should be placed a minimum of one month prior to event and are subject to availability. Cakes are priced according to the size and work involved. You might get an estimate at the beginning, but the final quote will be made after all the design and delivery information has been confirmed. Our delivery fees are based on the distance round trip from our bakery. Set-up and delivery fees are additional to the price of the cake. We will not deliver if the road is rough terrain, but can meet you at nearest paved road. Faux cakes require the same amount of skill, labor, and time as our edible cakes, so they have similar costs.